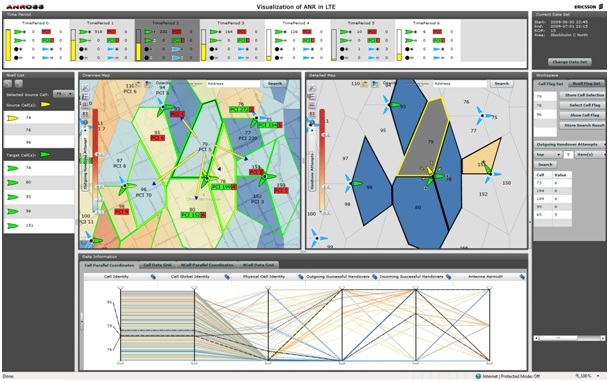 VoSON (Visualization of Self-Organizing Network) is developed in close collaboration with our research telecom partner Ericsson and allows the operators to follow, interact with and analyze the evolution of a self-organizing network under the operation of an automatic algorithm such as ANR. VoSON increases comprehension of the behaviour of a self-organizing network and supports network examination by visualizing counts and attribute values of cells and cell relations over time. It further gives possibilities for filtering and high-lighting extreme values using parallel coordinates. With VoSON it is possible to examine and gain insight into the problem that may have caused a situation. Ho Q, Åström T, and Jern M, “Geovisual analytics for self-organizing network data,” reviewed proceedings in IEEE Conference and Symposium on Visual Analytics Science and Technology (IEEE VAST), Atlantic City, USA, 2009.